Automakers knows there's big money in the aftermarket, especially for compact cars that on their own rarely make much on the sticker price. No surprise then that Mopar's showing off what they can do, creating a 210 horsepower factory-tuned Dodge Dart. They call it the Dodge Dart GTS 210 Tribute. The performance upgrades available in the Dart GTS are pretty straightforward. The Stage 2 performance kit gets you an improved air-flow intake and a low back-pressure exhaust to bump the 2.4-liter Tigershark Multiair2 engine's output from 184 to 210 horsepower. If you want changes to the suspension, you're going to have to look elsewhere. For those of you who just want to show off, you can order the Stage 1 appearance package, which nets you some matte-black trim, spoilers front and rear, a rear diffuser of questionable aerodynamic merit and 18-inch forged alloy rims. Oh, and you also get that carbon hood with a NACA-style scoop. The last car with Alfa Romeo underpinnings that had a NACA-ducted hood was the gorgeous Montreal from the 1970s. While the Montreal was a finicky, unreliable siren of a car, this Dodge looks like it will be something a bit more manageable. 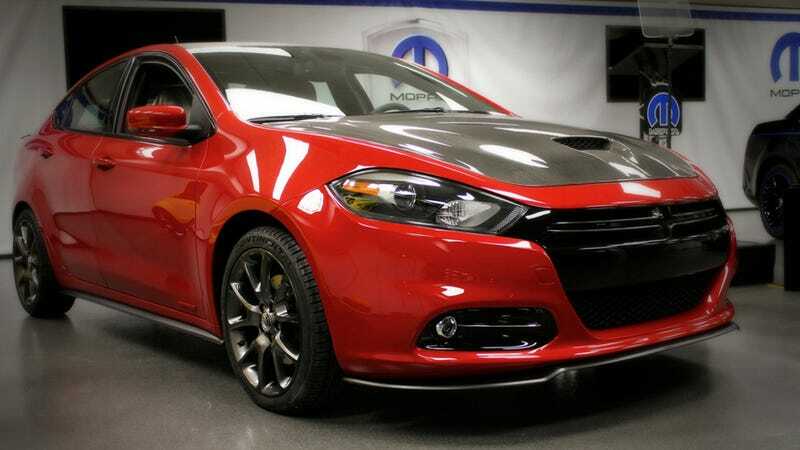 The question still remains if the Dart GTS' 210 horsepower will be enough to win over America's speed-crazed tuning crowd, or if it can fill up high school parking lots on its racy red/black looks alone.